Not much this week, except for one book that hadn't really been on my radar 'til just now. 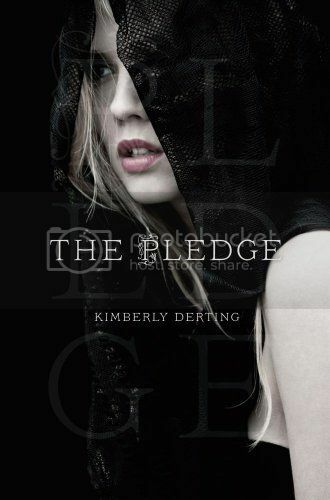 The Pledge by Kimberly Derting, out next month by Margaret K. McElderry books. It's about a girl in a dystopian society where social class is determined by how many languages you can speak, and she has a magical ability to understand all of them, even though she's not supposed to. I started reading it and now I can't tear myself away! The Pledge is definitely on my TBR list. Enjoy it. I'm so glad you're liking it! Been looking forward to this book since I heard about it. I read this a few weeks ago and unfortunately I didn't enjoy it much. Hopefully it'll be more your taste. This was my WoW post last week! I hope you enjoy it, its been getting some pretty mixed reviews. I am so so excited for this book, I wish I had it! Lucky! I've been wanting to read that! Let us know how you like it!